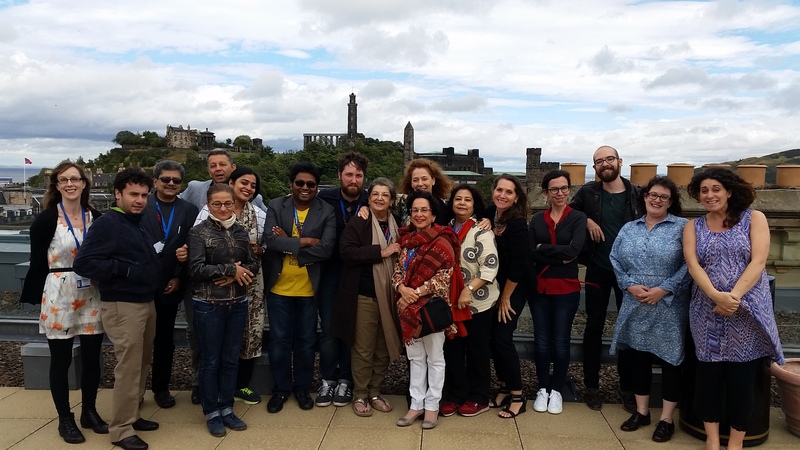 Posted in Arts and tagged British Council, Ed Showcase, Edinburgh, Momentum on September 3, 2015 by Debesh Banerjee. We never stop telling stories, do we, small and tall alike? Once upon a time I went to Scotland. There, in a castle in the dark, misty highlands, actually a modest hotel in Edinburgh, I found my flesh creep as I walked down its sinister corridor. We’d had dinner with Jock McArthur only the previous night, and the next morning he’d been found with his throat slit. The chill finger of suspicion pointed at all of us. Oh, all right, there’s a wee bit a yarn-tellin’ here. We were part of a ‘murder weekend’, then still a new tourism lure. ‘Silly gimmick’ i’d thought to myself when i was invited to it, but we were all unwittingly drawn into the plot by the wicked witches, aka the professional players pretending to be guests like us. Once upon last week, i was once more in Edinburgh, again at the heart of storytelling as actors and artists, clowns, kings and queens of all sexes created the fairy-tale world of the Festival’s ‘Fringe’. Like all good stories, theirs made us laugh, cry — and think. A bunch of us litfest organisers had wound our way from Kolkata, Kuala Lumpur, Bogota, Bucharest, Budapest, Bali, Lahore and Mumbai to a gypsy caravan called Momentum Literature, hitched for four days to the International Book Festival. Every night, we gathered in a baroque tent for Jura Unbound. ‘Jura’ was the sponsor, the fairy godmother needed by all real-life events. Professional storytellers ‘unbound’ the tales of Hans Christian Andersen or the Brothers Grimm and recast them for the here and now, which has its own rags-to-riches stories — and certainly no dearth of ugly ducklings swanning around. So, did the golden coaches turn into pumpkins during the day? No! We continued to be bewitched by the luminous passages read by authors from their new books. Skilful moderators drew out the writer’s own stories of wandering through dusty, musty archives, finding the Aladdin’s lamp of inspiration, and the magic kiss of publishers who don’t easily fit the description of ‘Prince Charming’. Very grim and no fairy tale were the Amnesty International panels dedicated to writers and journalists killed for their courage. Not everyone lives happily ever after, but the story must be told. Post written by: Bachi Karkaria. Courtesy: The Times of India.